The hybrid course plans, which are made using the most modern aerial photography and surveying techniques, consists of rectified aerial photographs containing dimensions (so-called orthophotos) in which the point and line objects surveyed in high precision not directly visible in the aerial photograph (such as green limits, water boundaries, distance posts, sprinklers etc.) are entered. Thanks to the absolutely precise re-creation of reality, the map18 course plans are provided with so many individual features (e.g. green and fairway borders, trees, bushes, bunkers, buildings, parks, watercourses, sprinklers, distance markers etc.) 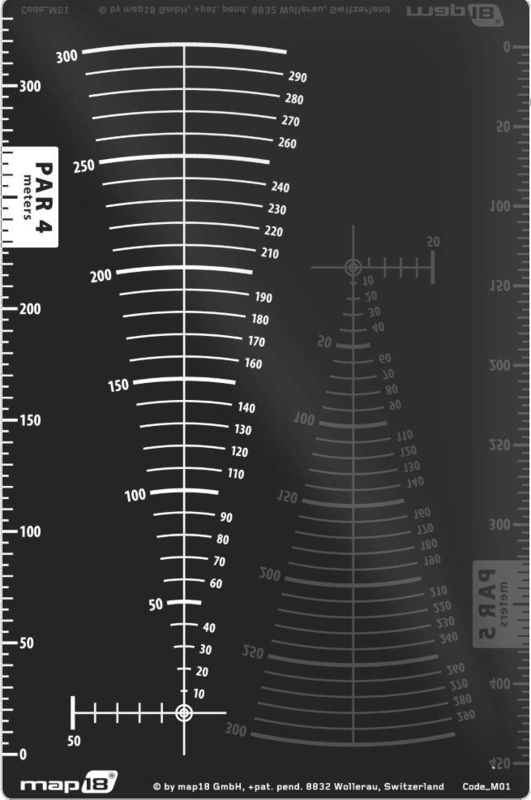 that it is easily possible to determine your ball position to within a meter. The map18 scale, which is made of flexible, transparent plastic and is easy to hold, contains two different distance measurement methods in one. On the front, there is a scale for the par-4 holes (with a scale precisely matching the par-4 course plans), and a scale for the par-5 holes on the rear. The rectangular indentifier printed on each of the course plans shows very simply which scale is to be used for the corresponding hole without the possibility of mix-ups. 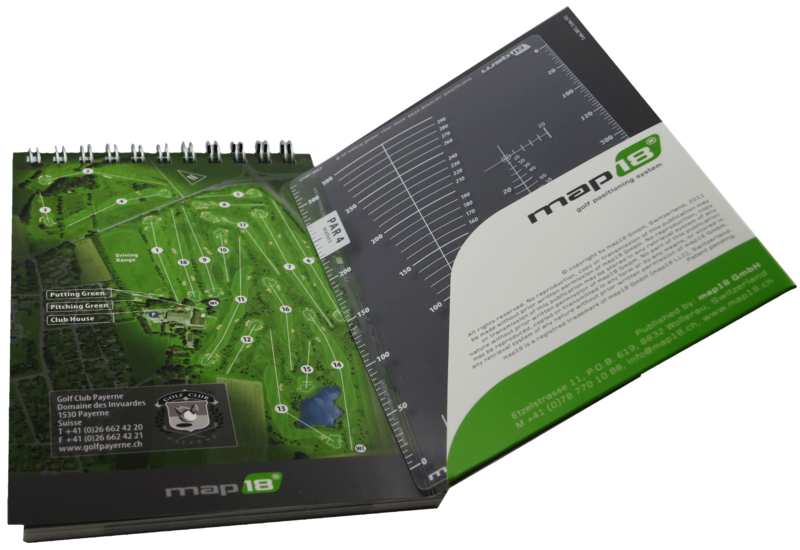 Precise measurement of all the required distances on the golf course is possible using the map18 scale, which only weighs 6 grams. Hills, trees or even fog can no longer present obstacles. 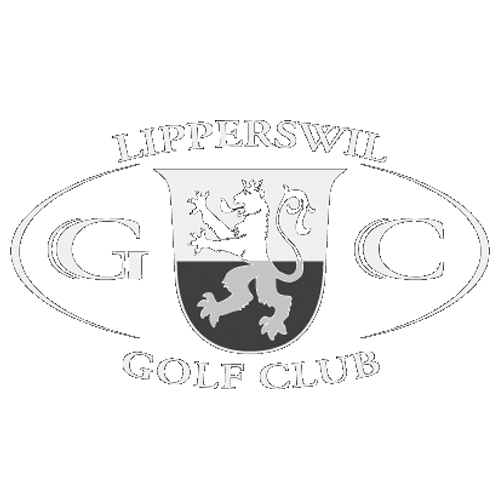 The map18 scale is available both in meter and yard versions for all map18 courses whether the course is located in the metric or imperial world. This means that every player on any map18 course will always have the distances available in his preferred units. You are playing a par-4 hole. After the strike, you walk to your ball and locate its position. Mark this in the map18 guide, place the scale on top - and immediately you will see all the current, stroke-relevant information, the precise geometry of the green, the surrounding obstacles, the distances to the start of bunkers, to the end of bunkers, to the green beginnings and ends etc. 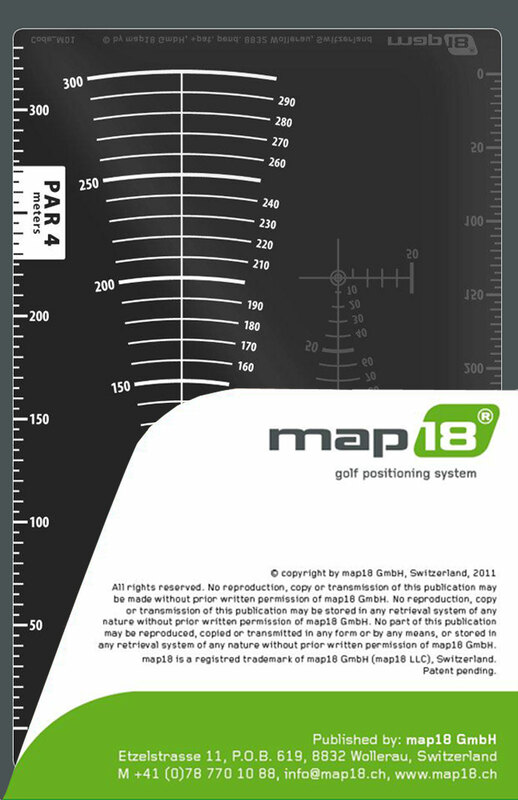 All the distance informations with regard to your current ball position are available exclusively only with map18 without complicated mental arithmetic or the use of electronics! You will be able to see exactly which obstacles might confront you at which distance, and where there is space, and how much of it there is. The procedure is of course the same for a par-5 hole. 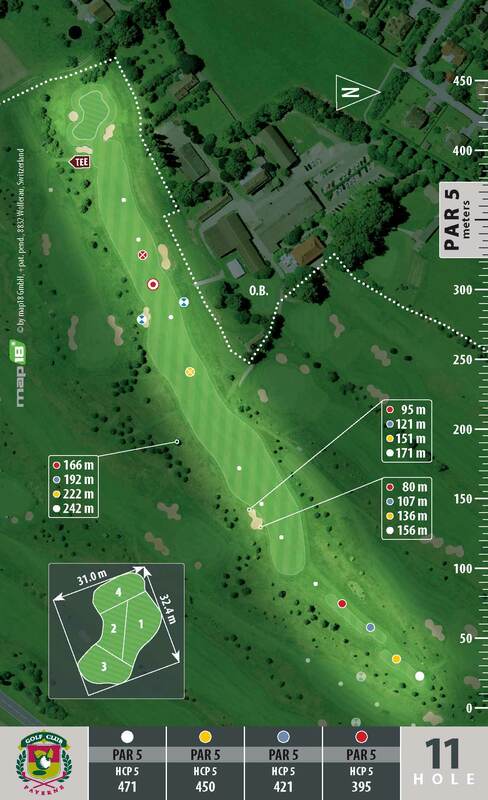 Simply change to the corresponding par-5 scale by turning the scale over, mark your ball position, and you will have all the course and distance informations available at a glance. In the case of par-3 holes, which are played to immediately on the first strike, you do not need a scale. 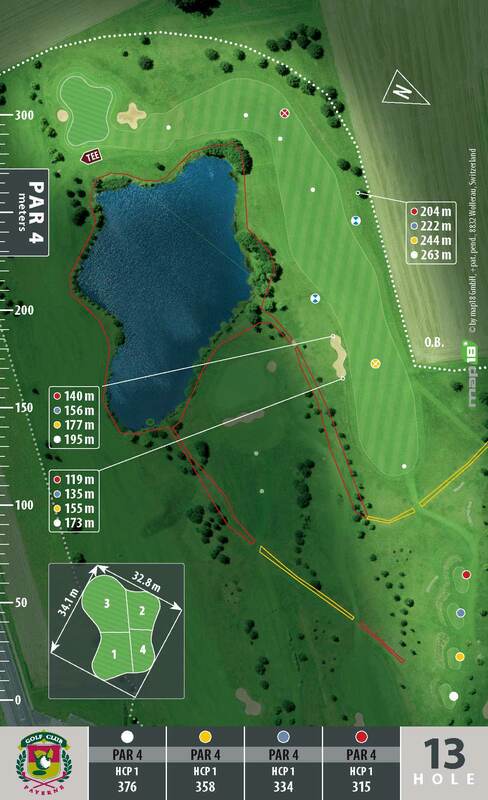 All the distance informations in the form of green concentric distance rings is available directly from the course plan. Thanks to the absolute true-to-reality and true-to-scale images, you can determine the precise ball position using the individual features (e.g.  fairway and green borders, trees, bushes, bunkers, buildings, watercourses, sprinklers, distance markers etc.) directly, and mark it on the map18 course plan with a pencil. 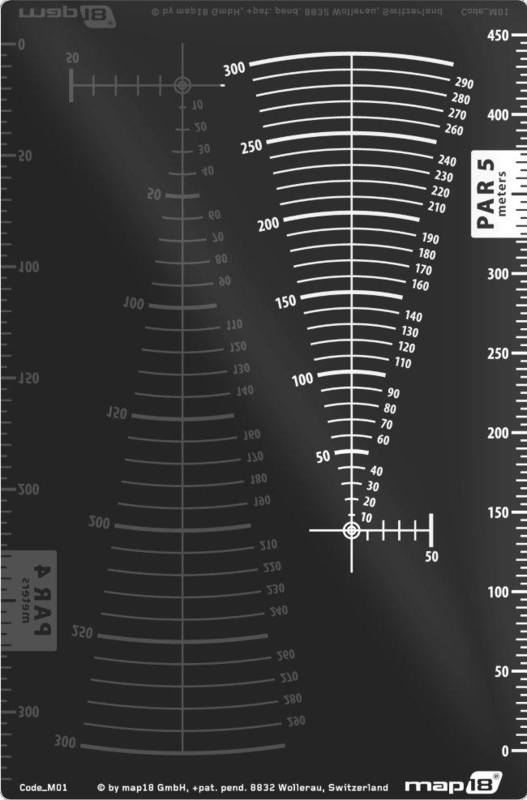 If the ball position is not immediately obvious, simple geometric aids can help: Using paces (any professional surveyor knows that any average-sized person's normal pace is almost precisely 1 meter long) you can measure the distance(s) to the next identifiable object (e.g. fairway border, bunker and etc.). It is very easy to create further precise geometrical position definitions by identifying so-called extended lines, i.e. straight lines which run through two uniquely identifiable points (e.g. a tree and a building corner). You will soon see how simple, precise and quick this method is the first time you use it on the course. Even while you are walking to the ball you will normally have identified its position fairly precisely. According to our investigations, you will reach absolute positional accuracy, which means a measured accuracy within one meter - in other words a value which meets the requirements of professional tournament players - with a little practice, and this can only be compared with a hand laser distance measure when measuring directly to the flag. 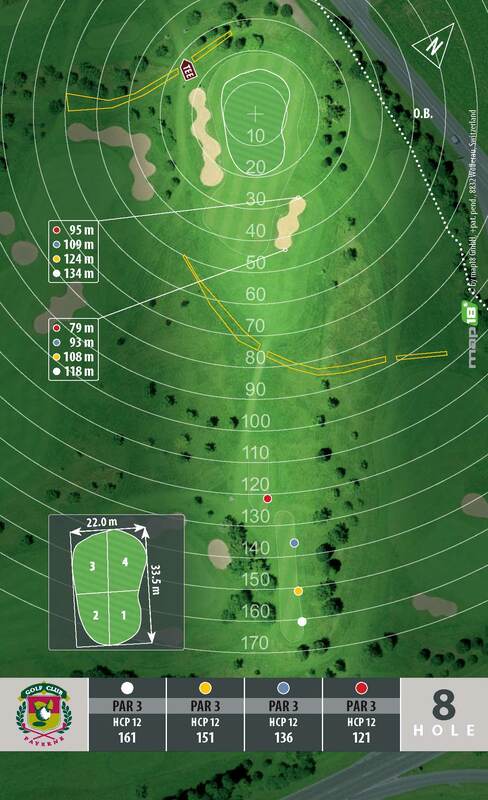 If you use map18 you won't just have extremely precise distance values with a direct view of the flag, you will have them all the time you are on the course. This also applies if the ball lands on the wrong fairway and you do not have a direct view of your current fairway through the thick bushes. This high precision mainly results from the precise plan basis (professional surveying accurate to the nearest centimetre) and the orthophotos of equally high quality. In comparison: the well-known handheld GPS devices and smartphone GPS apps, which work without the so-called differential GPS technology, actually show the distance on their display "to the nearest meter", but their actual accuracy is several metres at the most (this is defined by the absolute positional accuracy of the GPS receiver in the device). The positional accuracy and interpretation reliability of most of these devices is, of course, not really improved by the fact that meter distances such as end/start of bunker or start/end of green need to be calculated to permanently defined points, but the position of the points is not dynamically adapted to the current ball position, which is what most golf players assume. In other words: The direction in which you are playing towards the green has no influence on the definition of the so-called green start. 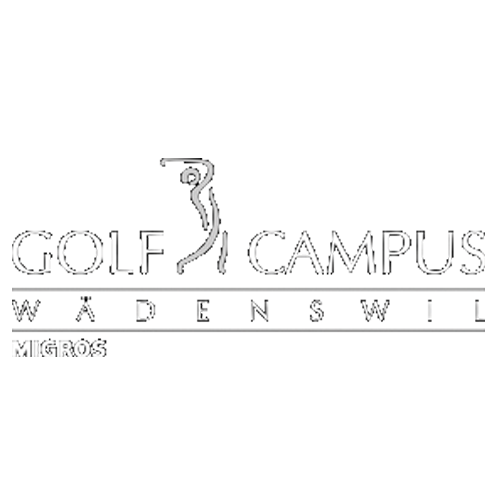 In most cases, golf GPS users have no idea what their system is measuring. If you use map18, everything is transparent and logical. Just as easy as possible. map18 also enables you to systematically measure and analyse your stroke lengths, carry distances etc. after you have played a round whether you're in the clubhouse or at home. Every stroke you make during your round and want to record can simply be marked in the guide with a pencil. Mark the position with a cross, and next to it the stroke number and an abbreviation for the club (e.g. 2 / E7). You can simply measure a stroke which is representative of your game and enter the length on the map18 distance notes page with the corresponding club description. The longer the series of measurements, the more significant and reliable your personal stroke length statistics are. These can of course always be refined by simply extending your stroke length records to cover specific gradients or inclines (e.g. 10 m height difference over 100 m).